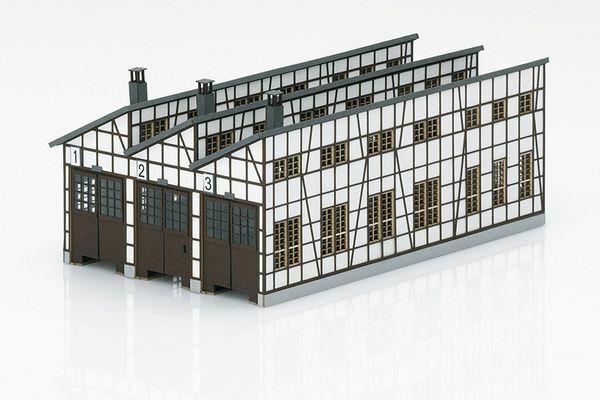 Prototype: Locomotive shed for steam and diesel locomotives in Rottweil. Model: This kit is a 3-stall locomotive shed that can be built one next to each other and one behind each other. 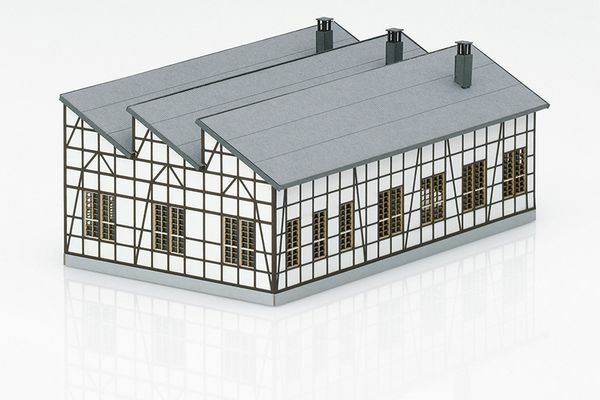 Four (4) each of this kit are required to build a scale model of the "Rottweil" locomotive shed (2 each next to each other and 2 each to lengthen the structure). The workshop side building is included for the prototypical structure (prototypical with 5 locomotive stalls and built-on workshop). A possible option is a 6-stall structure without a workshop. Mechanically opening and closing doors are included. Servomotors (not included with the kit) can be installed to open the doors. The center-to-center track spacing fits the 7294, 72941 transfer tables. This kit consists of colored architectural-quality hard cardstock, laser-cut. The kits features the finest, laser-engraved details. Extensive instructions for building the kit are included. Dimensions of the 3-stall locomotive shed (L x B x H): 308 x 233 x 118 mm / 12-1/8” x 9-3/16” x 4-5/8".